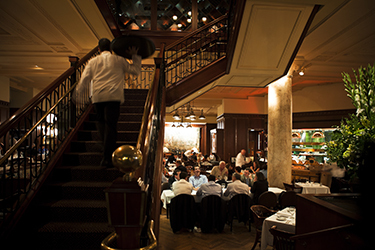 Grill 23 & Bar has been setting the standard for steakhouses in Boston for more than 30 years. Known for excellence in steakhouse classics, Grill 23 & Bar is renowned for exclusively using all-natural, prime beef as well as for fresh, creative seafood presentations and local produce from sustainable farms. Located in the historic Salada Tea Building, Grill 23's elegant decor maintains original turn-of-the-century sculpted ceilings and massive Corinthian columns. Mahogany paneling, green marble accents, spotless brass detailing, and oak floors give Grill 23 its classic, refined ambiance. Since it first opened in 1983, Grill 23 & Bar has consistently earned rewards and recognition for its fine food and service, always scoring in the top categories in Zagat Boston for Most Popular, Top Steakhouse and Top Service. It has been named "Boston's Best Steakhouse" for multiple years by The Improper Bostonian, and has been lauded as "Best Steakhouse" in Boston Magazine's "Best of Boston" issue time and time again - both as recent as 2016. In the Bar, small plates range from the creative to comfort fare. More substantial offerings include Butcher's Cuts and a special premium burger selection elevates the bar favorite with unique toppings and variations, and is presented with silver domed service. The wine program offers an award-winning list of over 2,000 old and new world varietals, varying between well-known brands to smaller boutique wines from various regions of the world. The craft cocktail menu offers specialty cocktails ranging from the classic to inspired reinventions. Grill 23 & Bar also proudly boasts one of the most extensive scotch programs in Boston, with selections offered by the flight or the glass, from 12-50 year old selections. Grill 23 & Bar is the first restaurant in Boston, and one of very few restaurants nationally, that offers a premium cigar service for guests following dinner service.